The Health Office at Maine East High School is staffed by one certified school nurse, Ms. Klein, and one registered nurse, Ms. Wheeler. Direct care for chronic and acute illnesses and injuries is provided and appropriate referrals are made, if necessary. In addition, vision and hearing screening, blood pressure monitoring, and health education and counseling are available. Student health records, as well as any paperwork or documentation of a medical or health-related nature are confidentially maintained in the Health Office. Doctor’s notes, PE excuses, elevator passes, and medication passes are handled through the Health Office. All seniors must provide documentation of having received the meningitis vaccine prior to the first day of school, August 13, 2018. Please contact your health care provider to make arrangements to be vaccinated. Please provide documentation to the Health Office. Students will be excluded from school if these requirements are not met. Please contact your physician to obtain the appropriate documentation. The Health Office at Maine East High School is staffed by one certified school nurse, Ms. Klein, and one registered nurse, Ms. Wheeler. The Health Office is open Monday through Friday between 7:30 am and 3:30 pm. Direct care for chronic and acute illnesses and injuries is provided and appropriate referrals are made, if necessary. In addition, vision and hearing screening, blood pressure monitoring, and health education and counseling are available. Student health records, as well as any paperwork or documentation of a medical or health-related nature are confidentially maintained in the Health Office. Doctor’s notes, PE excuses, elevator passes, and medication passes are handled through the Health Office. 1. Exclude student from school. 2. Notify parent/guardian and refer to physician for diagnosis. 3. Follow the Illinois State Health Department Rules and Regulations for the Control of Communicable Disease. 1. Follow State of Illinois Rules and Regulations for the Control of Communicable Disease and individual school’s procedures. 2. Doctor’s note will readmit student. School attendance is important for effective learning and academic development. Most children, unless they have a specific medical problem, should only miss a few days of school a year. It is important to notify the school nurse if your child suffers from a medical problem, particularly if it will impede his/her school performance or attendance. Absences should be reported to the Attendance Office. Communicable diseases and hospitalizations should also be reported to the nurse. If a student becomes ill/injured at school, he/she would report to the Health Office with a pass from the teacher to be evaluated by the nurse. Before a student who has taken ill or becomes injured in school is sent home, the Health Office will confer with his/her parent, guardian or emergency contacts as designated by parents to arrange for his/her transportation. Parental consent is needed whether or not the student can provide his/her own transportation. 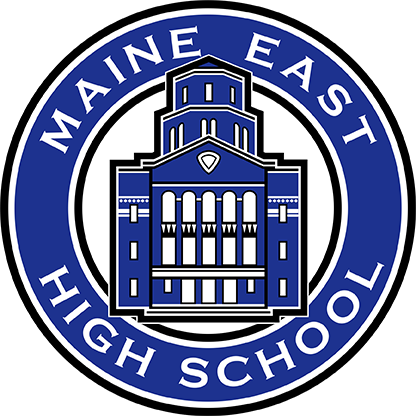 A student entering or enrolled at Maine East High School is required to have on file, proof of a physical exam and proof of the appropriate immunizations as required by law and the Department of Public Health. Students entering the ninth grade, as well as new/transfer students, must submit proof of a physical examination with required immunizations. Proof of this physical examination and immunization record must be submitted on the required state form. The physical examination must have been completed within one year prior to the first day of school. STUDENTS WILL NOT BE ALLOWED TO START SCHOOL WITHOUT A CURRENT PHYSICAL EXAM. Parents will inform the Health Office if there is any physical disability or health problem, the student will not be excused from physical education without a doctor’s notice or the updated health report on file. Parent/Guardian will be notified in writing prior to the date when the student’s immunization no longer meets state guidelines. Some students with special needs or medical conditions may require the administration of medication during the school day. Medications are limited to those required during school hours and necessary for maintaining an optimal state of health for academic success. Self-administration of medications, with supervision by the school nurse, is expected at the high school level: facilitating self-reliance and student responsibility. With the exception of EpiPens and asthma inhalers, all prescription and OTC medication is kept in the school health office. A medication request form, completed and signed by the physician and parent, must be submitted to the nurse for all medications. Written permission for prescribed or non-prescribed (OTC) medications at school must be renewed annually. The school nurse does not dispense any OTC (over-the-counter) medications, including aspirin or Tylenol. All medication is brought to school must be in the original container appropriately labeled. Prescription medication must be provided in the pharmacy bottle/with the pharmacy label. Questions about specific medication procedures should be directed to the school nurse. The purpose of these procedures is to limit medication use in school, yet assure safe administration of medication for those students who require them.